Lois Lane enters the Daily Planet, disguised as a man. This is the sort of thing that could have easily been heavy-handed, but I’m really glad is not; instead, Lois’ first scene in Lois & Clark: The New Adventures of Superman serves as a nice literalization the path women often were–and often still are—forced to take in order to obtain professional success. We haven’t chanced as much as many like to think we have. We still live in a society where someone like Hillary Rodham Clinton—one of the most impressive public figures of the past thirty years–cannot express strong emotion in public, lest people—including some self-identified liberals–start thinking variations of “just like a woman.” As subversive as Elle Woods is, the world is still miles away from Legally Blonde‘s,where one can be girly—very girly–and still be recognized as being professional and smart. In order to be recognized for one’s worth, one needs to abandon everything (*1) that suggests womanhood, be it emotion, fear, or the very things that distinguish us from machines. 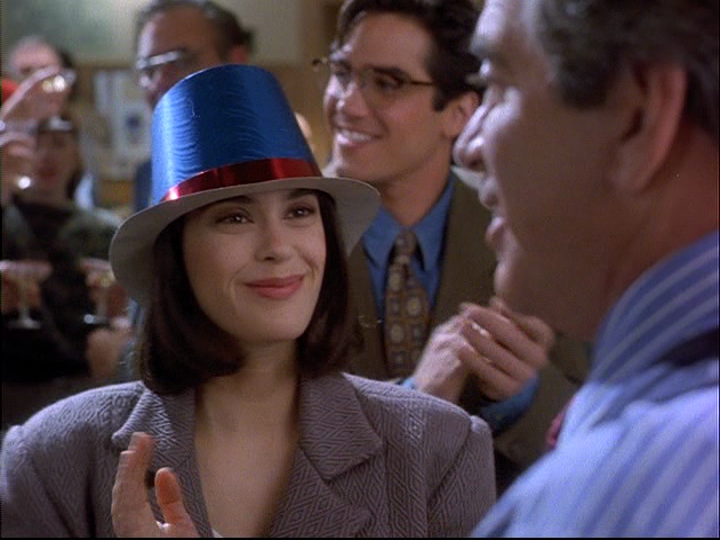 So right from the beginning, Lois & Clark: The New Adventures of Superman has something to say about women and society, and how our titular reporter fits into that. It is that understanding that fuels its take on Lois Lane, the ur-career woman. When we see Teri Hatcher asserting in no uncertain terms that she is top banana, we know that she knows it’s a survival mechanism: if she’s not careful—if she ever lets her employers forget that she’s The Best Reporter On The Planet, and they ever start thinking of her as the woman they can just task with whatever needs doing that day (say, showing rookie reporters around) the career and reputation she’s made for herself and loves is over. In a bit of an ironic reversal, the show with the most unaffected Clark has the Lois Lane who is most obviously performing. Just like there’s usually been a difference between Clark as he actually is and Clark as he presents himself to others, the Lois Lane we see working on The Daily Planet in Lois & Clark not quite her true self. It is only with Clark—Superman—that she can let those defenses down. Just like Lois eventually comes to accept that Superman can’t always be Superman—he’s also Clark, with all his preferences and quirks and flaws—Clark also accepts that Lois Lane is not just the hyper-competent reporter for a major Metropolitan newspaper: she’s the woman who likes caramel apples and is biased against farmers and cheats at Scrabble. While these things most likely won’t be mentioned in the museums time-traveling baddie Tempus assures will be dedicated to her in the future (which oh my crap yes) but are still vital parts of her, and are therefore parts Superman loves to pieces, while at the same time understanding that they don’t negate the part of her that’s tough as steel. (*1) Okay, not everything, but talking about how physical attractiveness plays into sexist narratives regarding professions is beyond the scope of this essay. Sorry, folks. (*2) I really want to hear the story of why Lucy was written out, particularly given her initial prominence. Her actress, Elisabeth Barondes, was even included in the opening credits for the pilot , which is especially weird when one realizes that Eddie Jones and K Callan–who play Jonathan and Martha Kent–aren’t. It would have made more sense to me if she’d been written down either immediately after the pilot or later in the season, after the showrunners had a good idea of what worked and what didn’t, but not after three episodes. Special thanks to Eli Alperin and Certain Shades of Limelight for their support and assistance in the writing of this essay.